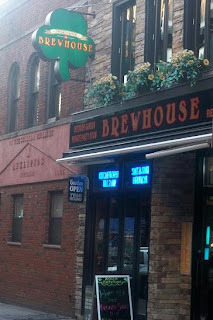 I couldn't believe it--Indigo bar changed its name to the Astoria Brewhouse. The name change seemed to come out of nowhere and I decided to inquire if anything else about it had changed. Interestingly, nothing else is different. They will have new menus with 90% of the items remaining pretty much the same, they're just cleaning it up a bit and getting rid of a few unpopular items. The decor remains the same and business is as usual - no new management either. Just wanted to clarify its status in case you were wondering what was up. Nada! Thank you! I had wondered! I ate there a year ago, it wasn't half bad. Whew. Thanks! Was worried there for a bit. Used to be my local hangout. Yeah, all is the same - I really like that place too. It's a good staple for burgers and for watching sports, especially football. This place is fun and pretty cheap for brunch too. Pretty sure they own a couple of other spots as well. Just as an FYI...if you want to try some great Eastern European Beer and some of the absolute best Czech/Slovak food IN THE CITY...try Zlata Praha just a few door down. Old fashioned? Yes. A fun experience? Absolutely. Thanks Anon - I like Zlata Praha too but actually prefer Koliba for great Slovak food. Still owned by the same management? That's a shame. I was secretly hoping it changed when I saw the new sign. Used to like the place, but the management was so terrible and so rude that I pretty much try to tell everyone I know not to go there.